As Fairtrade supporters, we’re also in a great position to be able to make our little daily purchases really count for something. Every time we choose Fairtrade, we’re choosing to actively reduce poverty by investing in some of the world’s most vulnerable communities. 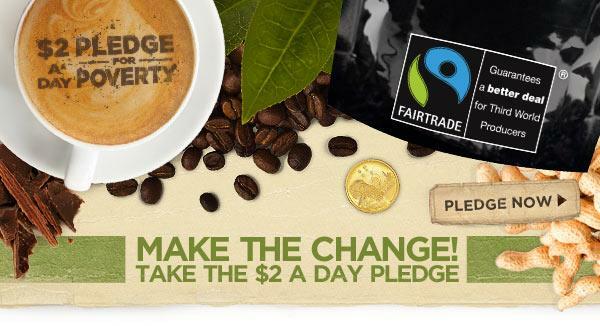 So to commemorate the International Day for the Eradication of Poverty on October 17, we’re asking supporters to pledge to spend $2 a day on their favourite Fairtrade products for two weeks. Will you take the pledge? It could be your daily coffee or tea, a chocolate treat, or perhaps a gift for a friend (did you know there are now Fairtrade t-shirts and sports balls)? It’s such an easy, effective and often delicious way to make a difference in your everyday life. Buying Fairtrade means farmers and workers in developing countries actually receive a fair price for their crops and produce. Fairtrade also supports them to directly invest in their business and communities through additional funds, which means they can build the things we take for granted every day – schools, roads and hospitals. Last year alone, AU$25 million worth of Fairtrade coffee sales in Australia and New Zealand helped provide farmers with over $2 million in additional funds to spend on their businesses and their communities. Who says coffee can’t change the world? Make your $2 work for a better world. Pledge now!